While doing some press today for his upcoming film Movie 43, director Peter Farrelly spoke to us about the much discussed and eagerly awaited Dumb and Dumber To. Over the years, the film has been on and off and despite the Farrelly brothers insistance that it is coming, the various delays and setbacks have led many fans to believe that we would never get the film. Today though, while speaking to Farrelly, he assured us that the film was coming soon and that it was actively in development. In fact, he told us that we should expect an official announcement sometime soon. So there you have it, straight from the horse’s mouth. 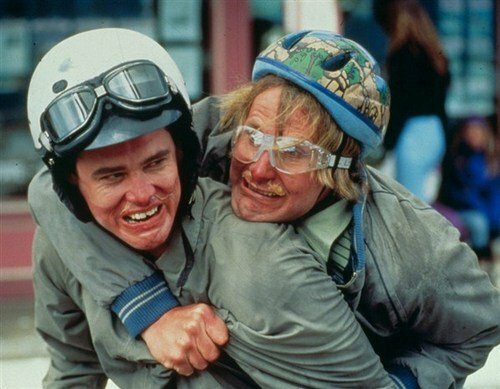 Dumb and Dumber To is still a reality and it may be closer than we thought. It sounds like it’s all coming down to the money (doesn’t it always?) and once that’s settled, production will get underway. Of course, this may take a while to all fall into place, financing is always tricky, but at least we know that the Farrelly brothers and both Jim Carrey and Jeff Daniels are all ready to go. It looks like the project has picked up a significant amount of momentum in recent months and I’d bet that it’s just a matter of time before we get the official announcement that Peter Farrelly mentioned. What do you think? Are you excited for Dumb and Dumber To? Does Farrelly’s comment give you more faith? Let us know in the comments below.